Friday night was the second time that Gresham and Sandy had met this season — the two squads played a non-league contest back on September 21. And even though this one was more tightly contested, the result was still the same. 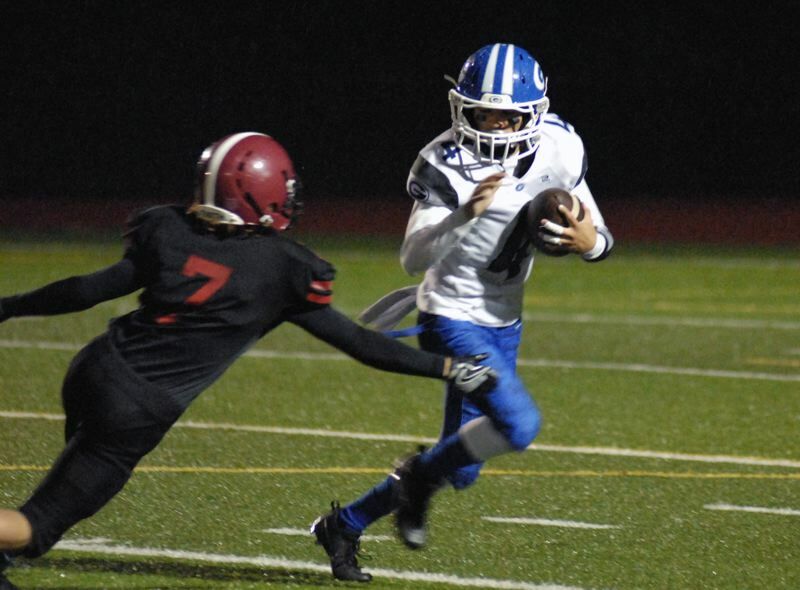 Colby Carson delivered the knockout punch with less than a minute remaining, running for a 50-yard touchdown to give Sandy the 28-14 win over Gresham. "This late in the season, it's all about getting the win," Sandy head coach Joe Polamalu said. "Gresham had a great scheme that made it tough to get things going offensively, but our goal was to finish out the season with two wins and that what we did." Despite struggling through parts of the contest, the Sandy offense looked as crisp as ever to start the game. After quarterback Chet Chamberlain hit Sam Fox for a first down in Gopher territory, the junior signal-caller found Glynne McGaughey in stride on a fade rout for a 31-yard score that put Sandy up 7-0. The four-play, 70-yard drive only took 1:14 off the clock. "It all starts up front. We can kind of tell how the game is going to go by how our offensive line is playing," McGaughey said. Gresham knew that they needed to respond. The Gophers fell behind early in their previous game against Reynolds and could never recover. So, on their first snap from scrimmage, Gresham pulled out a trick play that they had been working on all week. Quarterback Connor Henkle tossed the ball to Lucas Rhinevault on what looked like a traditional sweep play. But Rhinevault then pitched the ball to Noah Anderson while Henkle peeled off in the other direction and went down the field as a receiver. Anderson wound up and delivered a perfect ball downfield to Henkle, who scampered 65 yards for the score to tie the game. "We were just trying to get something special going and hopefully get a spark," Henkle said. "It was something that our offense needed. It helped a lot with our team morale." Sandy, however, didn't waste much time getting the lead back. Chamberlain found Carson on a 20-yard screen pass on third-and-15 to put the Pioneers in business. Moments later, a pass interference penalty on Gresham put the ball inside the 10-yard line and Chamberlain took it in for a 9-yard score on the following play to put Sandy on top 14-7. While it appeared that the Sandy defense had forced Gresham into a three-and-out on their next series, the Gophers had another trick up their sleeves. Gresham lined up to punt the ball away on fourth down, but Henkle, who is also the Gresham punter, faked out the entire Sandy defense and decided to take off after receiving the snap. He easily reached the first down marker to give the Gophers a fresh set of downs. However, the Gresham offense couldn't take advantage and did eventually punt the ball back to Sandy three plays later. Both teams traded punts until the midway point of the second quarter. Gresham looked like they were getting something rolling after Henkle hit Ethan Evans with a first down throw on an out rout. But a personal foul on the Gophers negated the play and they eventually found themselves with facing fourth-and-26 from their own 32-yard line. What happened next could have very well changed the outcome of the game.